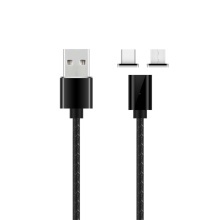 3-in-1 Magnetic charging cable for 8pin, Type C, Micro USB interface smart devices, with charging and data transfer function, practical and durable. Create wonderful experience for charging your smart devices. Built-in Blue LED indicator illuminates when the cable is active, clear in dark. Metal Port and premium PVC cover, Makes Product durable and resists kinked and rust-proof. The plug is separated from the cable. Plug can stay on the phone, Only 1 second connected to charge. The magnet connector could be a dust-proof plug and prolong the life of your device. In addition, it can reduce the damage of your USB port by preventing frequent plugging and pulling.